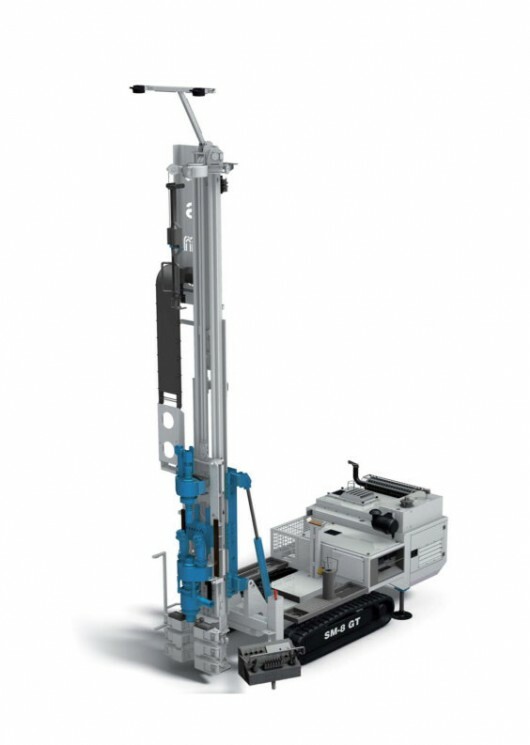 The Soilmec SM-8GT is a hydraulic drilling rig designed specifically for geothermal drilling. The rig is crawler-mounted and widely used for ground source heat pump drilling on residential sites. The fixed kinematic mechanism, wide section mast, and the pull-push system with a 98 kN hydraulic cylinder means drilling deep, precise bores. With a rubber tracked undercarriage and low specific pressure on the ground this machine is ideal for operating in gardens and private courtyards, typical in this kind of application, reducing the impact of the site. The drilling rig has a hydraulic clamp and breaker suitable for breaking drilling rods and an additional support for manoeuvres during feeding and recovery of the casings. The drilling battery loading (rods and casings) is fast and safe thanks to a special winch system with magnetic lifting.